The webinar “Best Practices For Deploying An IoMT Cybersecurity Strategy” shared valuable insights with HTM professionals who were eligible to receive 1 CE credit from the ACI for participation in the live presentation. 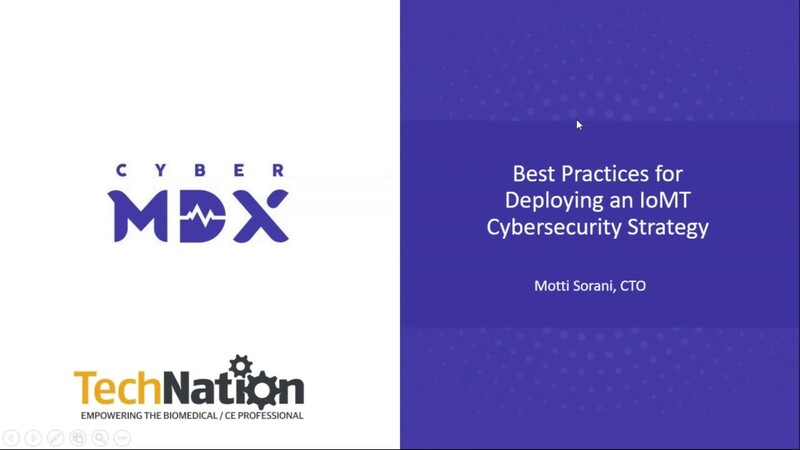 The 60-minute webinar featured CyberMDX CTO Motti Sorani. Attendees were taught the familiar crawl, walk, run mantra for managing any organizational or technological change fits well – allowing for a gradual progression of medical devices cybersecurity posture from building the assets inventory up to preventing cyber attacks. Sorani also discussed how the strategy, designed to minimize organizational burden, uses prioritization and incremental steps as success keys. More than 200 people attended the live presentation and more have watched a recording online. The session received positive reviews as did the overall webinar series. “The webinar was very informative and opened our eyes to many issues that could potentially affect our organization,” said J. Walker, supervisor of operations for clinical engineering. “Informative webinar. Good information to consider especially during this time of network hacking. Mentioned good processes to implement to protect devices from cyber attacks,” said P. Brown, manager of clinical engineering. “As security is past due to be an important issue in medical equipment, this was a very useful webinar for biomed and the future direction of the industry,” shared Senior Biomed R. Faut. “This Webinar Wednesday has validated a point that I have been trying to make to administration,” said M. Kersaint, clinical engineering manager. “Very interesting presentation, this opened my eyes to the trick that is out there and what we have to do to keep medical devices safe. Loved the video showing how easy it is for a hacker to control a syringe pump,” said A. Unsworth, BMET. “These Webinar Wednesday series have been very informative and another way for me to learn about different information that may be current, upcoming, and even information that may not be highly publicized. I try not to miss one, but I know that I can go back to watch and listen to them again,” Biomedical Equipment Technician A. Hale stated. “Each webinar is unique and very informative, the knowledge gained will assist in detecting any improvements that need to be done,” said B. Hayes, CBET manager. “This series is great. I love to learn something new everyday, especially when it’s free,” Biomed J. Stereff said. “Webinar Wednesdays provide education on a wide variety of Biomed and IT topics which help me to know the current issues affecting the field and strategies for addressing them. They are a must for continuing education in the field,” Biomed D. Page said. For more information about the Webinar Wednesday series, including recordings of webinars, click on the Webinars tab above.